South Africa’s one and only satellite, Sumbandila, has been out of contact with its Mission Control and has not downloaded any images since July. This was revealed on Wednesday by South African National Space Agency (Sansa) CEO Dr. Sandile Malinga. It is believed that the Earth observation spacecraft, built by Stellenbosch-based company Sun Space & Information Systems (SunSpace) and operated by Sansa on behalf of the Department of Science and Technology, was hit by a blast of solar radiation. This damaged Sumbandila’s systems and the satellite is now tumbling out of control. 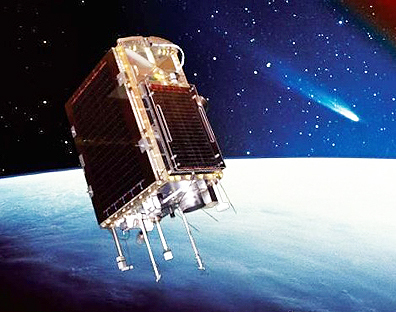 The South African spacecraft was largely built using carefully selected and modified commercial-off-the-shelf components, which greatly cut costs yet provide high levels of reliability but which cannot handle extreme space events in the same way specially designed and built – and extremely expensive – space components can. The construction of Sumbandila cost just R11-million. However, neither Sansa nor SunSpace have yet given up hope of re-establishing contact with and control of the satellite. SunSpace’s engineers believe that they only need three minutes of communication with Sumbandila to upload new instructions and restore control. However, the spacecraft’s battery, needed to power the control systems, is known to be run down and the satellite has only one solar panel with which to recharge it. Sumbandila sustained its damage in South Africa’s midwinter, and during this season its orbit exposes it to the sun less often, meaning that battery recharging takes longer. Malinga was speaking at a press briefing on the 62nd International Astronautical Conference, which is to be held in Cape Town from October 3 to October 7.